When I was a kid it was called being a stewardess. Today the politically correct term is a flight attendant. I had dreams of travelling the world. I graduated UCLA before I wrote my first story and then I became a housewife and a stay at home Mom, raising my three kids. In fact, it’s the same thing I did as I was a writer, too. My favourite memory is not from the distant past, but one that occurred just ten years ago. 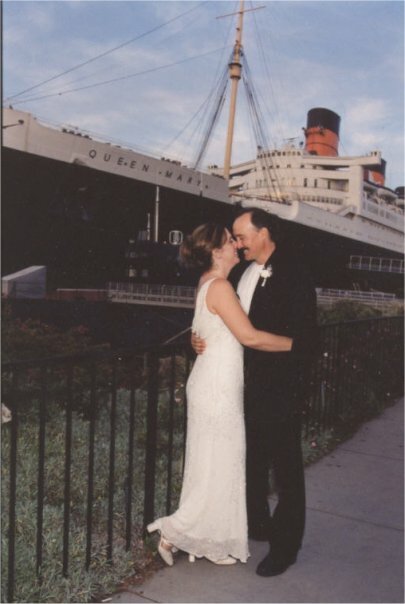 My husband and I renewed our wedding vows on board The Queen Mary in Long Beach, California for our twentieth anniversary. Our kids stood up for us: my oldest daughter as the maid of honour, our son as the best man and my youngest as the flower girl. My upcoming novel, With a Vengeance, is my debut release. It’s about two friends who realize they want more from their relationship. It’s set in the backdrop of CIA action and adventure. The project I am working on now is also a romantic suspense. It’s about a Russian hero and the heroine who figures out his secret. I’m hoping to have it completed by my birthday in May. When I had the kids at home, my days were unpredictable and full of surprises. I could never know what was coming next and always had to be prepared for the unexpected. Now that they are grown and I am entering into the anticipated “Empty Nest” my days are more routine. I rise late – one of the perks of the kids being grown – and take my walk. Walking is good to clear the mind and get it ready to work. I come home, shower, watch a little bit of Twilight Zone or M*A*S*H – another Empty Nest perk . Then I hit the computer to get started on the day’s work. What I am working on depends on what is due. Right now I am editing a suspense novel for submission and getting ready for The Brenda Novak auction where I will be auctioning off a mentor program. 1. My relationship with my husband of thirty years. 2. The relationships I have with each of my three children, and the relationships they have with each other. 3. That I was able to be a Stay at Home Mom while working in a career that I love. I got the best of both worlds. To my fiftieth anniversary where my husband and I will renew our wedding vows one more time and my oldest daughter will stand as maiden of honour, my youngest daughter as a bridesmaid and my son as my husband’s best man. All our grandchildren will be there and their children, too. It will be euphoric!! It would be a machine that takes the ideas for stories and characters straight from my brain and puts them onto the page without me having to type everything out. I’m a frustrated French student trapped in the body of a fifty-year-old woman. For as long as I can remember I have always wanted to speak a second or even a third language. My hope and dream is that I will return to the university this coming fall to obtain a degree in Modern Languages (French/Spanish). I don’t have any plans to travel with the degree, but it certainly would be possible to visit Paris and Barcelona. Thanks for visiting the blog, Jacqui! >>To WIN an e-copy of Jacqui’s book, WITH A VENGEANCE, please leave a comment below. Winner will be drawn on Wed 22nd May and notified on this blog and via email. Good luck! Visit Jacqui online at her website, blog, facebook, and twitter. You can also check out her book at Amazon and via her publisher. Posted on May 17, 2013, in Interviews, Past Present & Future and tagged author interviews, competitions, giveaway, jacqui jacoby, past present & future, romantic suspense, with a vengeance. Bookmark the permalink. 10 Comments. Loved reading your past, present & future Jacqui! Thanks for hosting Juliet! Thanks Coleen. I’m a little nervous about all the kids being gone — just two more weeks with hem home!! – but I am looking forward to all the writing time! Nas-gad you enjoyed it. It was sure fun to here and I am glad Juliet gave me the chance!! Thank you Juliet. I love that photo, too. Very special day for us!! Thank you again for having me! Hi Jacqui! Oh, I am so, so with you on the machine to connect my brain to a keyboard. Have you read the Stephen King book The Tommyknockers? One of the characters in that creates a telepathic typing machine. Oh, imagine! Wishing you all the best with With A Vengeance.